IS THIS A CONFLICT IN WHICH THE WEST SHOULD TAKE SIDES? It shows the risks of current US policy in the Middle East. Under successive US Administrations a close bond has developed between the US and two countries, Israel and Saudi Arabia. This has involved the West in taking sides in a civil war within Islam, taking the side of the Sunni against the Shia, notably in the vicious civil war in Yemen. This is no business of the US. These bonds have also made the reaching of an accommodation with Iran exceptionally difficult. There is a danger that the nuclear deal with Iran will be allowed to collapse. They involve tolerating Israeli policies in the West Bank and Gaza which make a two state solution physically and geographically impossible. The alternative to a two state solution is integration of the occupied territories into Israel, with equal voting rights for all, but that would change the fundamental character of Israel. So the military occupation continues, forty years after the war ended…. 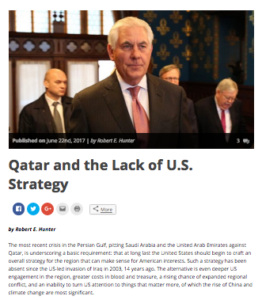 European countries are geographically nearer to the Middle East than is the United States, and are not self sufficient in energy, as the US is. But the European Union seems to have no influence on US policy in this area, which directly affect Europe’s interests. Traditionally Ireland took an even handed approach to these issues. It needs to assert itself on these matters within the EU.